by Harney & Son's Master Tea Blenders! I wrote a review many moons ago of this tea, after I first discovered it being sold in a local Mom & Pop coffee shop. I absolutely cannot promote this tea enough, because folks, it actually tastes like it has sugar in it flavor and texture wise, but it does NOT I assure you, nor does it contain any artificial sweeteners. It also goes by the name of Hot Cinnamon Sunset so don't be confused if you see two names on their website. It's taste is so incredible! It reminds me of a grown up version of a cinnamon jolly rancher, only, with incredible depth and a silky mouthfeel. I have tasted the green tea version and the black tea version and love them both equally. You can still read my full review of the teas on the product website pages. I go by Jemoiselle there, too. Wink. It is au natural baby! 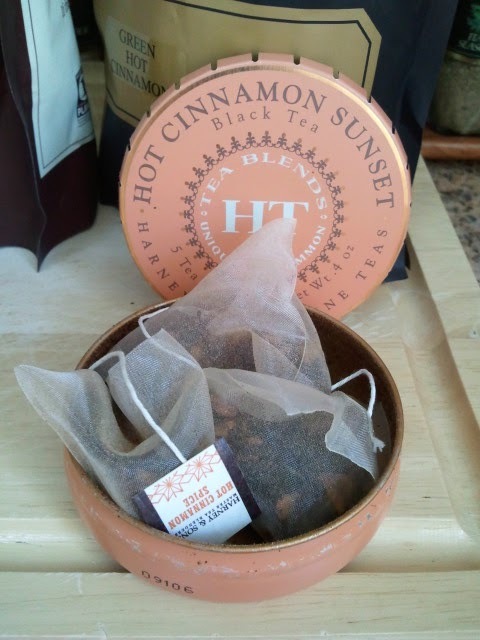 Three types of cinnamon, sweet cloves, orange peel and your choice of black, green or herbal tea equals fabulous! You can also order it decaffeinated, but as many of you know, drinking decaf anything is a risky choice due to the chemicals that are used to remove the caffeine being potentially dangerous. When you go to such lengths to protect your health, one tends to err on the side of caution! The Herbal version is naturally caffeine free, by the way. A perfectly portable cutesy little round disk of deliciousness, it comes with 5 silken satchets of Hot Cinnamon Spice tea nestled inside. It fits easily in your purse, and you can refill it with their bulk bags like I do, so you always have a sweet hot beverage when you're out and temptation comes knocking on your door! Everyone will ooh and aah at the aroma, I guarantee it. In my first photo I actually used the empty tin to show off the loose tea version, but I need to stress it does NOT come with loose tea in it! I did that for display only. It comes like the photo immediately above this text. It is inexpensive also, so just in case you're not quite sure you are ready to buy a big bag you can try it with this! I promise you though, if you buy only this, you will go through all of it in a couple days and mope around until your bulk order arrives lol. Don't end up kicking yourself in the behind, just buy a pretty tin AND the tagalong! I always wondered what the difference was between the Green Hot Cinnamon blend and the Hot Cinnamon Spice Black Tea blend. Well, here it is for your viewing pleasure! Note that they both really have the same amount of spice, orange peel bits and sweet cloves. My photo makes it look like the green tea has more, it doesn't! The back tea version is the one on the bottom, closest to the lens. The green tea is the one on top, of course right? Hehe. I love these teas so much, they are such a pleasure to brew loose. 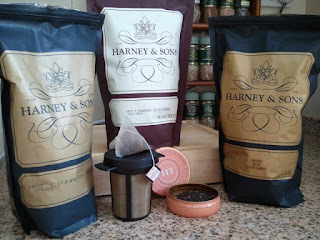 You'll also notice in my photo my loose tea filter, which I also got from Harney & Sons. It can be found here on their site. I love that it is made of stainless steel mesh, it can be used for coffee or tea, and is completely dishwasher safe. The lid doubles as a resting place for the strainer once done brewing. I adore it! I hope you enjoyed the first part of my Secret Weapon series! Stay tuned for the next two parts of the series, where I will reveal the ultimate way to enjoy living salt-free and talk about the machine every nutritarian shouldn't have to live without! You just gotta get ANGRY. "The world wants to be thin and healthy, but they don't want to earn it." Not only that, they don't want to believe it is their choice, so they cover their eyes and plug their ears and scream "la-la-la-la-la-la-la I can't hear you!" and take another bite of that steak and wait for their red wine to save them. Society will walk for a cure until the cows come home, but don't ask them to eat a veggie unless it is already 100% proven and guaranteed in writing to prevent cancer or forget it. But we'll throw back handfuls of experimental pills and shoddily produced new drugs rushed through the FDA's "safety" screening procedures as quickly as possible. We'll take packettes full of supplements and vitamins and extracts and mix isolates into sugar drinks for good health like they are going out of style...(which in most cases, isn't so far from the truth) even when the labels openly say they do NOT treat, cure or prevent anything. "PROOF!...said the food genie. And all was well in candyland again. " ...and yet when confronted with living proof in lieu of scientific proof based on what the Average American *thinks* is scientific proof (read: aired on FOX News or some baloney like that) aka living proof like me for example, a person who has beat medical problems (acne, eczema, migraines, sleep disorder, severe allegies, back pain, IBS) and weight problems (-45 lbs in 5 mo!) alike after many devastating years of anguish and hopelessness (so I thought) I am dismissed because I don't PROVE anything. I am so sick of hearing the world "PROVE" in responses to my transformation and lifestyle choices! Then it hit me. The defensiveness that exists in this world is NOT the fault of the resister, it is the fault of the drug. The food. "That people would stare living proof in the face and dismiss it and resent it even for existing to me, screams what a cupcake would say if it could talk." Or maybe that was the pot roast oinking back, I don't know. LOL "You're crazy and I invalidate your attempt to exist amongst me because I haven't been PROVEN to hurt you! You love me, I taste great! I make you feel GOOOOOD! Moderation is key, right? They could have gotten their health problems to spontaneously resolve, all of them, by many variables none of which has been proven to be eating a plant-based diet." I don't want to try to convince those who truly don't want to be healthy that they should be, nor do I insist that it is impossible for someone to be healthy if they eat whatever they want, hey, some people's bodies seem to do just fine no matter what they do to themselves! I do mind though, when those angry foods come back to haunt me in the form of people who eat them being defensive. I know it is my job to avoid that defensiveness and always present myself in a way that does not blame or shame, but sometimes it feels like no matter how hard I try to mingle with people who don't eat like I do, on the topic of food anyways, I end up getting bitten by the cupcake instead of the other way around! And folks, I am tired of those darn cupcakes biting at my ankles! YOU are awful! You lure us in with unbelievable flavors that stimulate us like drugs, making us into legalized socially encouraged addicts. You have convinced us to defend you and teach even our children how nourishing you are even while you continue to hurt and injure us publicly, young and old alike, with a ferocious vigor I detest. You say you only want to make us feel good, but after we eat you, and feel overly full and uncomfy, get too fat for our clothes, develop medical problems and perhaps have a heart attack or two, we somehow cannot stop ourselves from indulging again and again. We cannot imagine a life without you, all the while, our lives are slipping through our fingers like sand because of you whether in the form of depleting health or you stealing our joy when we look in the mirror and feel disgust for what we see doesn't match who we feel we are inside...until even worse, it finally does. I am so ANGRY with you, I never want to see you again. You are like the abusive spouse who hits it's mate, apologizes, then tells their victim they dare not ever leave them because they'll never find anyone who will love them more. Bah. Don't bother calling, I won't answer. I remember the night I became a nutritarian so vividly. I cried for HOURS. I was very overweight, sad, a fraction of who I had the potential to be, in the prime of my youth and wasting it over cheeseburgers! I found a photo that night of myself in the past, when I was younger and thin, and just burst into tears. Then, I felt an answer to a prayer and the urge to go pick up a book that I had already owned for TWO YEARS and only had read the intro and closed it, knowing that it asked of me what I would not give up at that point in my journey. I felt a new strength. I WAS SPITTING MAD and ready to do something about it. That's the hook line and sinker here, folks. You HAVE to get MAD! You have to get ANGRY! Then and only then, I believe, you will be ready to accept and embrace what is broken so that you may fix it. --a salt-free seasoning that tastes salty and adds a ton of flavor to soups, raw nuts, broth, stock and even popcorn but has absolutely no salt whatsoever and no potassium or chemicals. It is all natural and blow-your-mind amazing. Nothing like it on the market! I promise you can't find anything like this at your local health food store. This is not Mrs. Dash or SPIKE, not even in the same universe! --A delicious gourmet spice tea that naturally tastes as sweet as candy but contains NO sugar or artificial sweeteners of any kind. Period. Just tea leaves and spices! It is simply divine and calorie free, naturally. 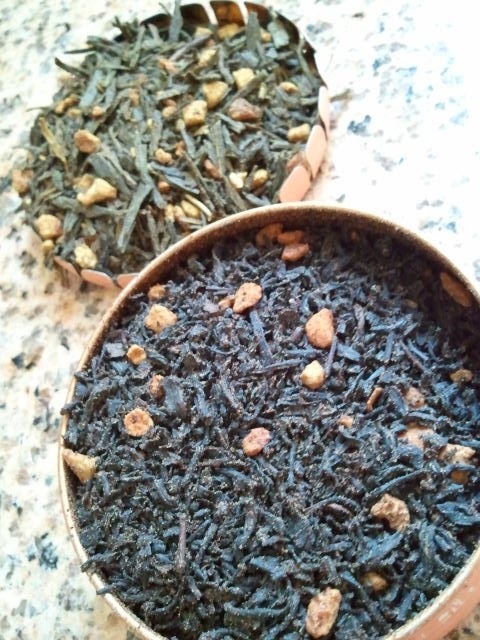 The same tea is available in three custom blends: black, green and herbal. --A very versatile commercial quality machine (with a hefty price tag) whose functionality, incredible ease of use, quality and ability to withstand the test of time actually makes it worth the price for once! I am no big spender either, but this one does so much for me it has paid for itself and I have owned it for 3 years plus. In addition, the company that makes it is as classy as they come, and takes GOOD care of their customers to the "nth" degree. Keep an eye on the blog for those posts, coming soon! Anyone who knows me knows I don't really measure ingredients when I make my soups, though I should I like the variation in taste. So, for tonight bare with me please! Sometimes, you just have to experiment and run with it! 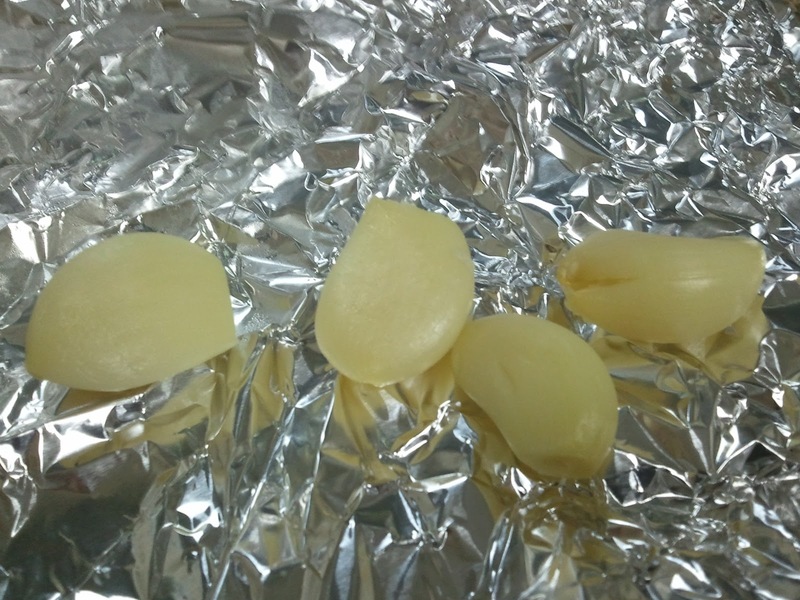 I boiled this until the carrots were tender, then made some roasted garlic with about 6 big cloves in the oven. It's easy! 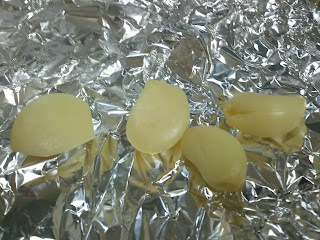 Separate garlic cloves from bunch, wrap in tin foil with paper still on, crimp shut by hand and roast in hot oven until soft touch. I didn't even look to see how hot it was, it was in celcius anyhow so it wouldn't help me tonight! 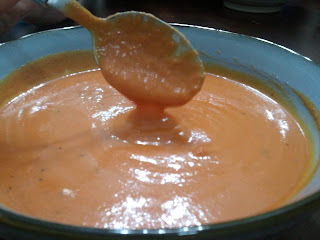 After the carrots were soft, I scooped them out along with the big tomato pieces and pureed them in a vitamix (very high powered blender/food processor) with about 1.5 oz of raw cashews. That is about one large handful! 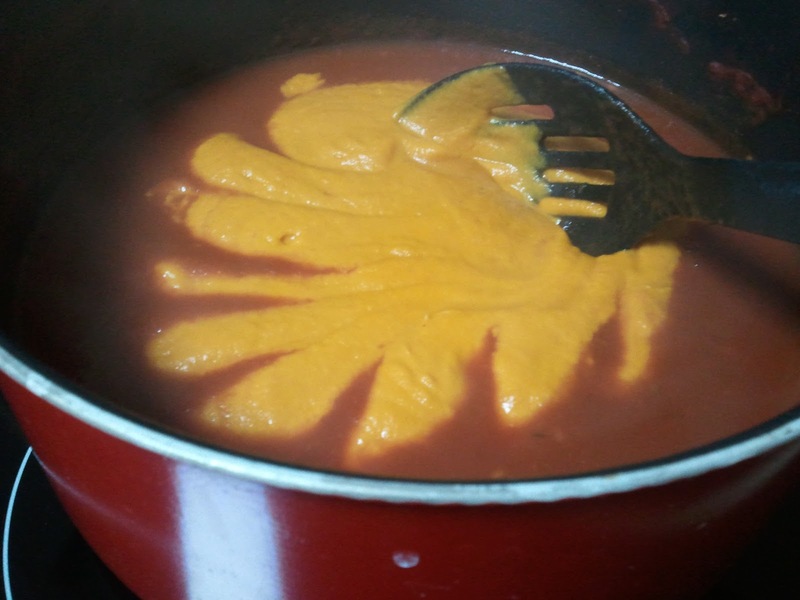 I added that to the soup, and was so taken aback at how lovely it was I had to take a photo. I wasn't planning on posting this! This was the defining moment folks. 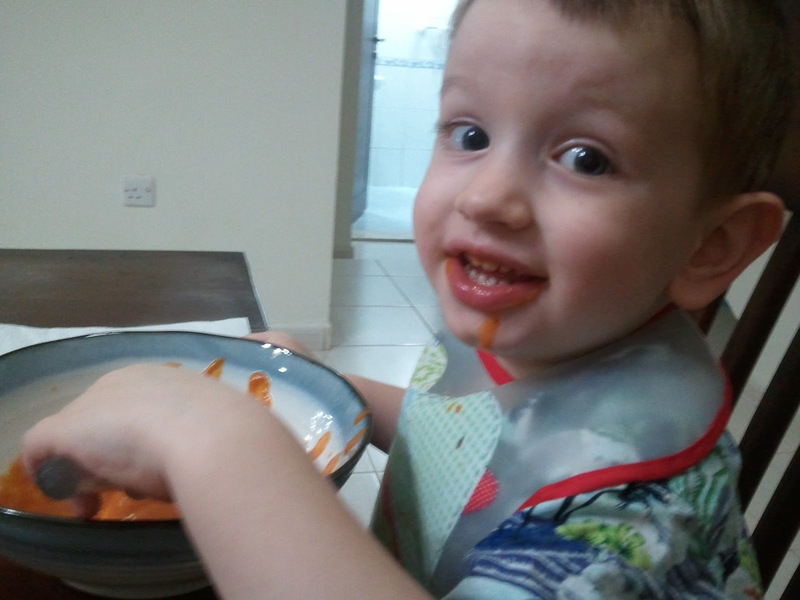 SEAL OF APPROVAL: TODDLER APPROVED! Savor and enjoy, guilt free, rich, creamy and worthy of a snowy day. Too bad in the Middle East there are none of those to be had! I'll just have to pretend! A HUGE thank you to BeStrixt for this fabulous idea! 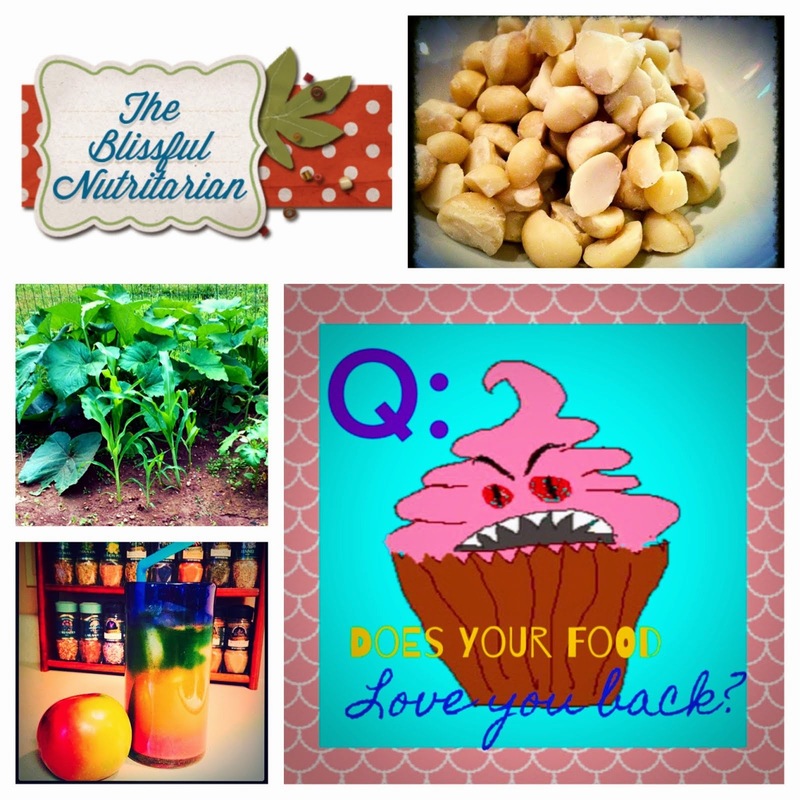 You really should check out her blog, she takes being a nutritarian to the ultimate gourmet level. I love it! Hello my dear, and welcome to my first post here at The Blissful Nutritarian! Why am I here, writing for you? Simple...If you are ready to change your life, I want to help you change. I want to show you just how lovely it can be living as a Nutritarian, blissful truly, through showing you how I enjoy the foods I eat as much as I enjoy my glowingly healthy (and svelte) reflection and incredible health. Do I sound a bit conceited? I'm NOT. The truth is, I went through SO much to become healthy AND happy. I have been to the darkest corners of self-loathing, the most sorrowful moments of regret and the most ashamed humiliated nightmares of reality in my short lifetime, and I feel PROUD to have made it back to "the light" hehe. Pun intended. I have earned my health, and am VERY proud of it. You can earn yours too, I'll help you when and IF you're ready. If you're not to this level of hurt yet, I don't expect you to understand. Consider yourself lucky. Plainly, it hurts when you are not healthy, plagued with the never ending dramas of being overweight, unhappy and out of control. It hurts us physically and emotionally, and it can take years to heal if ever. Being overweight when you don't want to be is tortuously painful, and I believe only the ones who have been through it truly understand the extent of that pain. I still carry my pain around with me, evident when I see old photos of me looking the way I did, knowing just how I felt behind the smiles and superficial masks. As the years pass as a Nutritarian, I can feel it lessening and lessening with each passing day. Still, it's there. That should explain to you why I'm here, why I created The Blissful Nutritarian, and what I hope to accomplish with this endeavor. 3. Enjoy myself as I write and photograph my favorite foods! As I said, bliss. Are you ready?